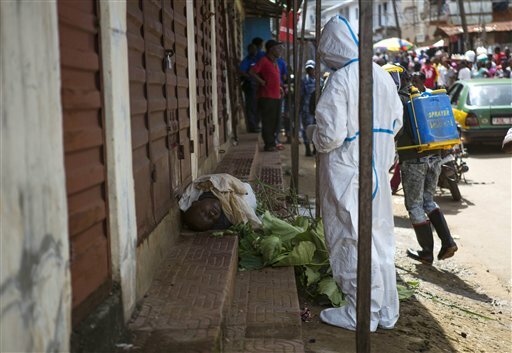 FREETOWN, Sierra Leone (AP) — Sierra Leone burial teams have gone back to work one day after organizing a strike over pay and abandoning the dead bodies of Ebola victims in the capital. In neighboring Liberia, however, health workers said Wednesday they planned to strike if their demands for more money and safety equipment were not met by the end of the week. The expressions of frustration by beleaguered West African health workers came as Spanish officials investigated whether a nursing assistant infected with Ebola got the deadly disease by touching her face with tainted protective gloves. The case of Teresa Romero is the first known incident of someone contracting the disease outside the West African outbreak zone. But in a radio interview Wednesday morning, Sierra Leone’s deputy health minister Madina Rahman said the strike had been “resolved.” Later in the day, a team could be seen loading bodies outside a government hospital for burial in the west of Freetown. The team’s leader declined to be interviewed but said members had been promised hazard pay by the end of the day. “The health ministry is going to investigate the delay in the health workers not receiving their money,” Rahman said. Tunis described the situation as “very embarrassing.” The government was already facing criticism this week over a shipping container filled with medical gear and mattresses that has been held up at the port for more than a month. “We give the government up to the weekend to address all these or else we will stop work,” Williams said. The average health worker salary is currently below $500 even for the most highly trained staff. Finance Minister Amara Konneh has defended the compensation for health workers, saying last week that it was more than Sierra Leone and Guinea were offering. More than 3,400 people have been killed this year by the Ebola outbreak in West Africa, which has hit hardest in Sierra Leone, Guinea and Liberia. In Spain, the case of nursing assistant Teresa Romero has highlighted the dangers that Ebola poses for health workers and the fact they can contract it even in sophisticated medical centers in Europe. Dr. German Ramirez of the Carlos III hospital in Madrid said Romero remembers she once touched her face with protection gloves after leaving an Ebola victim’s quarantine room. Health officials say Romero twice entered the room of Spanish missionary Manuel Garcia Viejo, who died of Ebola on Sept. 25 — once to change his diaper and again after he died to retrieve unspecified items. Ramirez said Romero believes she touched her face with the glove after her first entry. “It appears we have found the origin” of Romero’s infection, Ramirez said, but he cautioned the investigation was not complete. Romero was said to be in stable condition Wednesday. Health authorities in Madrid have faced accusations of not following protocol and poorly preparing health care workers for dealing with Ebola. “I haven’t got a fever today, I feel somewhat better,” she told the newspaper. In an earlier interview published by Spain’s El Mundo newspaper, she said she had followed safety protocols as part of the team treating two priests infected with Ebola. Her husband Javier Limon told the same newspaper that his wife went on vacation after Garcia Viejo died. She started feeling sick with a low fever Sept. 30 but still took a career advancement exam with other candidates. Health authorities say she did not leave the Madrid area during her vacation. In another interview Wednesday with Spain’s Cuatro television channel, Romero said when she started feeling sick and went to her local health center in Madrid’s suburbs she didn’t tell doctors she had helped treat an Ebola patient. She did not say why. She said she had received training about how to put on and remove her hazmat suit. She declined to give an opinion about whether the training was adequate. Yolanda Fuentes, assistant director of the Carlos III hospital, said Limon is in quarantine but has shown no symptoms of having contracted the disease. She said of the four others taken in for observation, three — a nurse, an assistant nurse and a man who had traveled to Nigeria — had all tested negative. If they test negative again they will be released. Another nurse admitted Wednesday is under observation but has not been tested so far for the virus. Paye-Layleh reported from Monrovia, Liberia. Associated Press writers Ciaran Giles and Alan Clendenning in Madrid contributed to this report.